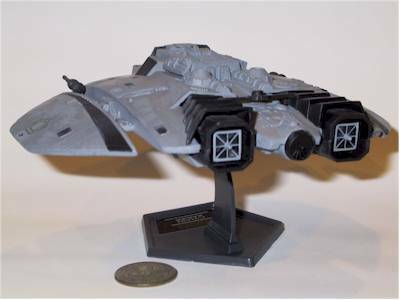 There's a new guest reviewer tonight, but he's an old friend - Headrusch writes in with his review of the two Battlestar Galactica ships from Joyride Studios. Take it away! Some History: The late 1970's. What a great time to be a kid, so many cool toys and gadgets to drool over. Toys just kept getting better and better the closer to the 1980's we got. Star Wars hit and was taking in ASSLOADS of cash, re-programming all our minds to just what "Cool Toys" actually were, and ABC Television was primed to jump on the sci-fi bandwagon. Enter Battlestar Galactica, Glenn Larsons answer to Star Wars. Basically it was Wagon-Train in space, riddled with Mormon overtones (Glenn is Mormon), even starring veteran actor Lorne Greene in the patriarchal role for the series (which he played the entire time he was on Bonanza, another huge moneymaker). Galactica had huge press, and huge hype. Did it live up to it? Heck Yes!!!!! Well......to my 9 year brain it certainly did. But others weren't so kind. The show was panned for being too juvenile, and its special-effects were considered sub-standard. Of course, what were they comparing the FX against? Right...Star Wars. When was the last the any movie went up against Star Wars in the FX department and won? Right. The shows colossal budget of around a million per episode (remember, 1978 dollars...a brand-new Cadillac could be driven off the lot for $10K) ultimately doomed it to failure, it was just too darned expensive to produce. The show disappeared, and kids like me who were absolutely SLAVES to the show, could no longer follow the further adventures of Starbuck and Apollo, except in the Marvel Comic. Mattel released a bunch of Galactica toys, which I loved every one......but then, like so many things, Galactica faded into history, replaced by the campy Buck Rogers in the 25th Century. But...as the intro always stated...."There are those who Believe...", and more than 25 years later, Battlestar Galactica is experiencing a surge in retro-popularity. With a "re-visioned" version of the series currently airing on The SciFi Channel, and more and more people watching the original series on DVD, BG is back and its got the new merchandise to prove it. Sure you can go to EBAY and get the Mattel originals many of us had (and still have) as children, but they're showing their age...those formerly white vipers are all turning to aged yellow...the figures... well...they stunk anyhow so who cares. No, a NEW toy line was needed to resurrect this show, even if it was only aimed at 30-something guys like me. JoyRide Studios is the company picking up where Mattel left off so many years ago. 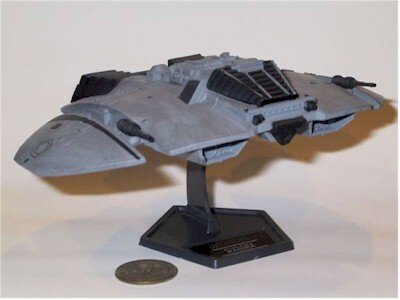 Among their first series of releases for their new BG line based on the original series, are two of the main "stars" of the show....of course I am referring to the Cylon Raider and the Colonial Viper fighter craft. Yeah Yeah an Apollo and Starbuck figure are in the mix too, but lets not kid ourselves. We want the ships, and now thanks to JoyRide, we've got them. 2 out of 4 stars, simply because its generic. Blister-Carded, not boxed like the old ships were, the card art is adequate. Merely adequate. There are no graphics indicative of the TV show, no glowing face of Lorne Greene or Richard Hatch. Nope, just the Battlestar Galactica title and a Cylon Raider chasing a Viper. You can tell these are aimed at the Suncoast crowd, and wont be fighting for any space on the congested shelves of your local TRU. A nice space background, perhaps showing the Galactica and her rag-tag fleet would have been a lot easier on the eye. <shrug>. I guess you gotta save pennies somewhere. I mean, they are toys from Battlestar Galactica...and the Galactica is nowhere to be found anywhere on the card art. For me this packaging doesn't work visually. Physically, its a bubble on a card, how can you go wrong? 3 out of 4 stars for the Viper, and 2.5 out of 4 for the Cylon Raider. The Viper Paint really works, although I'm not sure of the color. I think the Viper really needs to be a few shades lighter gray than they color they chose. Still, the washes and weathering came out ok for a mass-produced item. Its a little excessive around the rear engine pods, but the photos make this effect stand-out more than it does in real life. Blame the flash. The Cylon Raider looks good, but its looks a little too monotone for my tastes. Perhaps its because I wanted to see a little more shine on the flashier Cylon ships. The weathering applied to the Cylon Raider is ok, but looks a little more out of place. Its kind of a similar situation to the Star Wars ships: The Empire's ships should be shiny and new, and the Rebel ships should be dirty and a little beat-up. They got the look right on the Viper, but the Cylon just looks a little plain. Hard to peg really, I also think the ship needs to be a darker color gray. 'd better go back and check the series again on DVD. The logos and "racing stripes" are well done. Detailing on the cockpit however, the "gray support beams" that are painted on the canopy I mean, those didn't come out well. The light gray color on the canopy supports look "wrong". I'll probably take a black Sharpie to them in the future. The paint apps have the same "dull matte-coat" look to them that many toys in this category have. Painted-Resin-esque I call it. The Cylon Raider gets a 3 out of 4 stars, and the Colonial Viper gets 2.5 out of 4. The reason for this is simple, the Colonial Viper is fragile, and the Cylon Raider is a frisbee. The Cylon is depicted like it was in the show, with its laser cannons sticking out from where the wings "break" from the fuselage of the ship on each side, the cockpit opens but that is the only moving part. So its basically a Frisbee. But the Colonial Viper has floppy-wings. Near as I can tell these need a dab of glue applied to them, because anything that jiggles gives one the impression that it might be removable or adjustable. Attempting to do so on my part resulted on the top vertical stabilizer snapping off in my fingers with the slightest of pressure. Krazy-Glue to the rescue, but you are warned...those wings on the Viper are fragile, don't mess with em! :) Also, the "Fit and Finish" on the Cylon left a little to be desired. I don't know if it shows in the photos, but the detail piece directly behind the cockpit on the Cylon Raider is a separate piece that is affixed to the rest of the raider. Mine wasn't pushed into the fuselage 100% and there is a gap. Booo-Hisss. I suppose I could pry it out and re-seat it, but given my luck with the Viper...I'm leaving it the hell alone. 2.5 out of 4. I suppose since I paid $15 each for these online, I might say that they aren't worth the money, considering their size. $7-$10 seems more reasonable. Then again, I've had 25 years to save my pennies for "New Battlestar Galactica Toys" so the hit isn't so bad. Also, since these are going to SunCoast and E-Tailers and wont ever show up on a Toys R Us shelf.....(I don't think).....$15 seems about right. Collector Premium Pricing, I suppose I should be happy they aren't $29.99 each like some OTHER lower-run niche figures being sold exclusively through smaller channels. These ships are a bit smaller than the old Mattel ships, but they'll fit right in with your average Galoob Action Fleet display. The Cylon Raider actually has 3 tiny little rubber cylons you can place in the cockpit (with tweezers), and the Colonial Viper comes with a little rubber colonial pilot who can also be seated in the cockpit of his ship. The Viper also comes with 3 pieces of landing gear which can be attached to the underside of the ship, so you can display the ship with the landing gear extended, or even set it on your desk without the included stand. 3 out of 4. They could be a little cheaper, they could be a little bit bigger, but the fact that they are even here at all is cause for celebration. They are highly detailed, well painted, reasonably weathered and just plain look good sitting on the shelf. If you're a fan of the show, and still have your Mattel toys slowly yellowing from age on your shelves, these will make a nice addition to your collection. But, I ouldn't hand them out to anyone under the age of 10.....they just wont survive. THINGS TO WATCH OUT FOR: Check the fit and finish on the wings of the viper and the piece on top of the cylon raider. Oh, and remember...don't touch them, they break. :) But for just staring at, they can't be beat! Suncoast and Media Play definitely have them in stock! Figure from the collection of HeadRusch.